I took the VCAP5-DCA exam on Nov 2013 and I thought I would share my exam experience after receiving the email that I had passed. 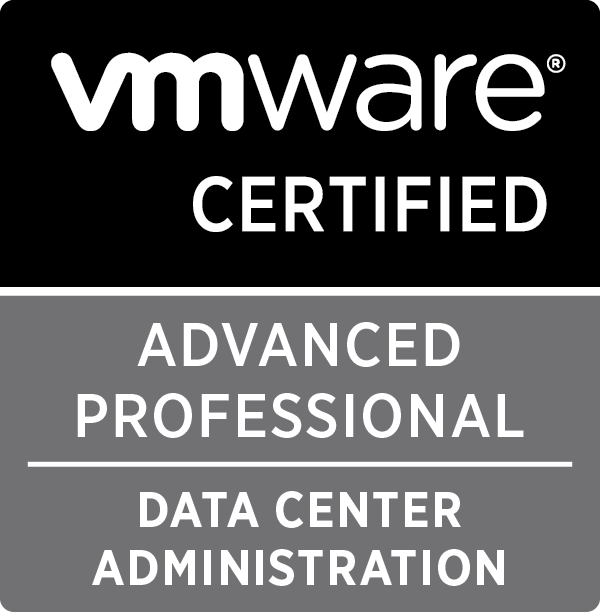 All content covered in the VCAP5-DCA test is based on the blueprint listed on VMware’s certification web page. Since this is a live lab test, there are no questions, everything is a task. You must read through the scenarios, understand the requirements, and perform the tasks. The test consists of 26 scenarios. Each scenario has a different amount of tasks. To understand how many tasks could be on the test, if each scenario had 3 tasks, then that would be 78 total tasks. While some tasks may be straightforward, a lot of the tasks test your ability to understand vSphere, its feature set, and what those features can do in different situations. Furthermore, you can skip a scenario or task and go back to if later. Thanks to Josh Andrews I had the opportunity to take the VCAP Test Track at VMworld 2013 & St Louis VMUG Conference. They are a great opportunity to test your skills on some exam like scenarios. If you have the chance to take the VCAP Test Track, it is well worth your time and effort. Use vSphere client in the jump box, not the vSphere client in the vCenter VM. I recommend using all the tools from the jump box. This will cause less latency and everything will go faster. You only have so much time, so you want to take any advantage that you can. The lab environment consists in a remote session on a Windows machine where you can connect to the lab systems: 2 ESXi hosts, a vCenter Server, a vMA and usually a Windows System with PowerCLI (could be the vCenter). All hosts have SSH enabled. When tasked with an “impossible” task, re-read the scenario, requirements, and tasks. If they don’t explicitly say you can’t do something and that something seems like the only way to accomplish the task, then you need to consider that option even if it not a task you would normally perform. Use Adobe Advanced search to search for something in all pdf’s in a folder : When you first start the test, open one of the PDFs and the go to Edit-> Advance Search. Choose All PDF Documents in: and then click the Browse for Location… option. Navigate to the PDF folder containing the vSphere PDFs and click OK. Enter your search term and click the Search button. This will allow you to quickly search through the whole set of PDFs with a single search. That being said, you still need to know specific terms for your search or you will end up with a lot of useless results. For example if you want to search for the advanced HA Admission Control settings, knowing that the settings begin with das. will result in targeted search hits. You can practice this technique before the test by downloading the PDFs and using Adobe’s Advanced Search against them. I always arrive at the testing site early just so I can try to relax before the exam starts. Since it has to be taken at a Pearson Vue Professional exam center, I had to drive a little farther than where I normally taken certification exams. Just like every other VCAP5-DCA blog I read prior to the test pointed out that time is your biggest enemy. I would like to add myself to that blog list: Time is your biggest enemy. You have 4 hours to complete the tasks. Don’t underestimate how long it can take to complete the multiple tasks that go with each scenario. As soon as I sat down the first thing I did was write 1 – 26 in a vertical column. Then when I completed a task I would put a check mark by that task number. If I did not complete a task number I would write a 2 – 3 word description about the task so if I had time to go back I could remember what that task was. You are able to skip tasks and go back to complete a task, but there is no review screen, so going back and forth to tasks is slow and can eat up valuable time. While I was confident that I did well on the tasks that I completed, I ran out of time and was not able to complete enough of the tasks to be confident that I passed the test. VMware administration is what I perform at work on a daily basis, so I am very familiar with the vSphere interface, but there are many tasks that I had to perform on the exam that I don’t perform on a daily basis. I felt this exam was able to test my advanced VMware skills.